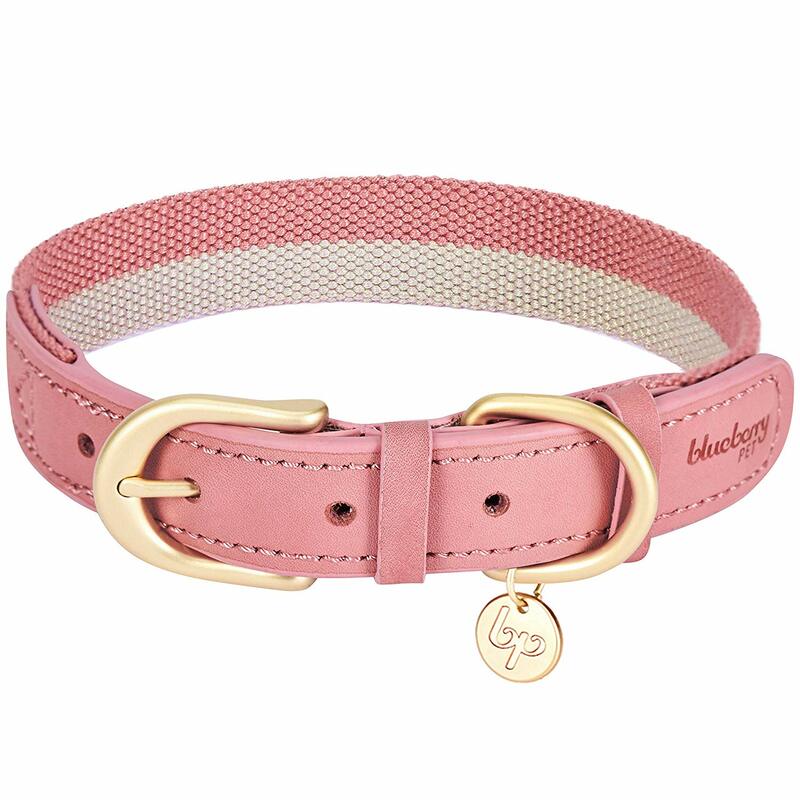 Designer dog collars are perfect for the adorable Morkie. 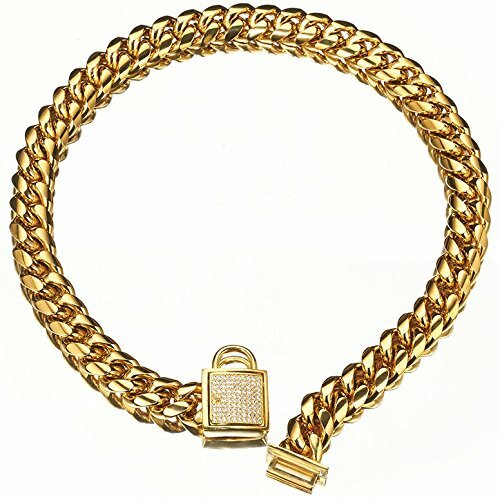 Whether we’re talking $3.2 MILLION, or $9.95, a designer dog collar just has that extra bling a Morkie deserves. 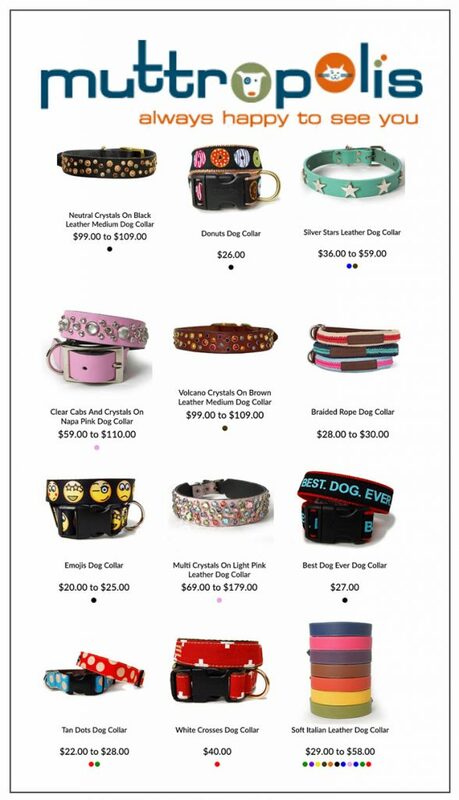 Here’s a brief look at the amazing range of designer dog collars available. Let’s start at the top: $3.5 MILLION! This may look like a queen’s necklace but it’s actually a designer dog collar. 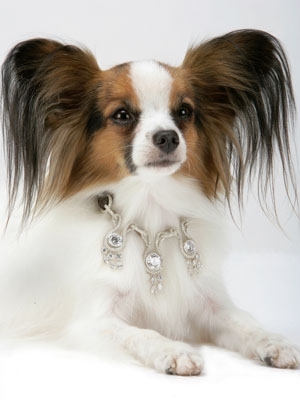 The Amour, Amour luxury dog collar is made with 1,600 hand-set diamonds, totalling 52 carats. AND, the strap itself is 18-carat white gold with crocodile leather trim! But where do you put the dog tag? 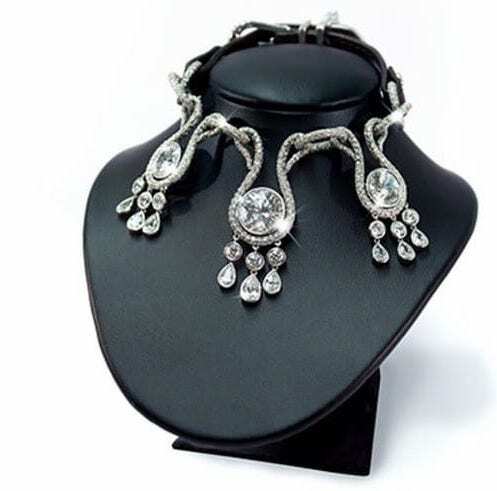 Created by I Love Dogs Diamonds, the dazzling, diamond-studded collar includes 3 brilliant 7-carat diamonds in its design. And don’t worry, it’s custom fitted to your dog. Wait, these collars are almost as cute. And you can find them in stores or order online. For a lot less than $3.2 million. Also available at overstock.com for just $5.00! Beautiful! And a matching leash is available. What’s the BEST collar to use for a Morkie? The best collar to carry your Morkie’s identification, is soft, pliable and not too thick. 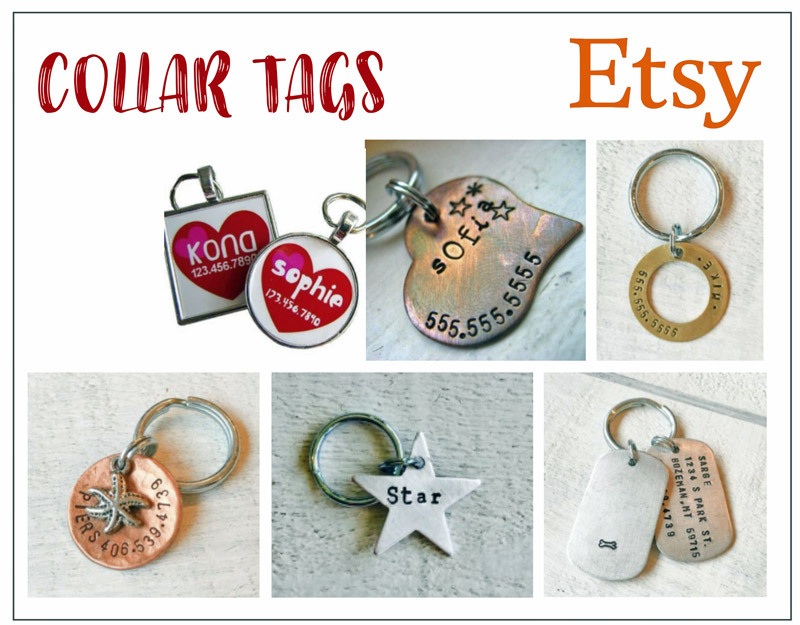 For identification, pick from an engraved metal tag, a metal nameplate that goes right on the collar or a collar with the name embroidered right into the collar. 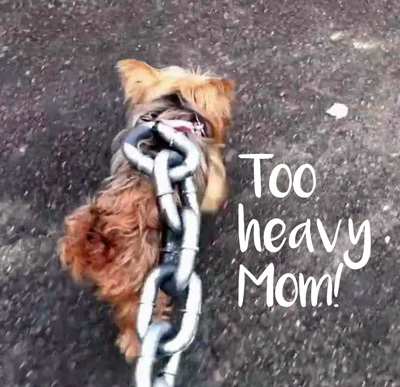 Chain – is not good for Morkies since it puts a lot of pressure on their throat when attached to a leash. Plus they’re quite heavy. Neoprene is rubbery and soft. It is waterproof and comfortable. Nylon collars are the most popular. They’re inexpensive, and come in lots of cute designs. However they’re not very durable, and can get dirty over time. But at the price, you can replace it. With a nylon collar, be sure it’s not too wide; pick the most narrow one you can find. Leather – looks good and last a long time. Again, don’t get one that’s too deep. 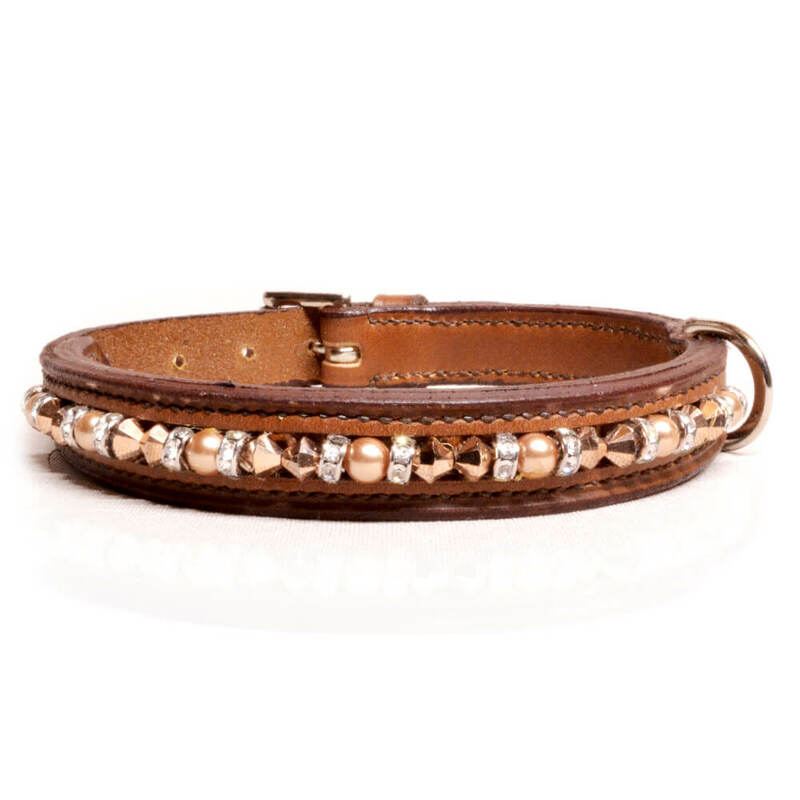 Leather collars come in a variety of colours and designs. Faux leather is inexpensive but breaks down quickly. Good for a ‘fast fashion’ choice. A small, plastic clip type of closing is fine for a small dog, since it’s not likely he can break it by pulling hard. Other fasteners are metal or the traditional buckle style. Yes, they fit better. But did you know that cat collars, by law, must release? So if the cat is caught up in a tree or in bushes and suddenly takes off, the collar will break apart without much effort. It’s a safety thing for cats. But obviously not a good thing if your Morkie suddenly decides to run. Measure your Morkie’s neck, hold the measuring tape firmly but not tight. Then add 2″. 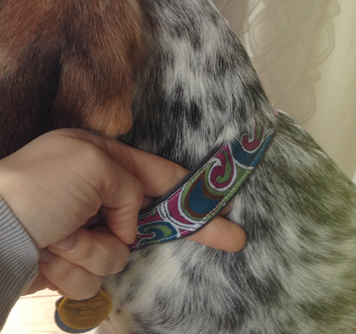 You should be able to slip 2 fingers under the collar when your dog is wearing it. 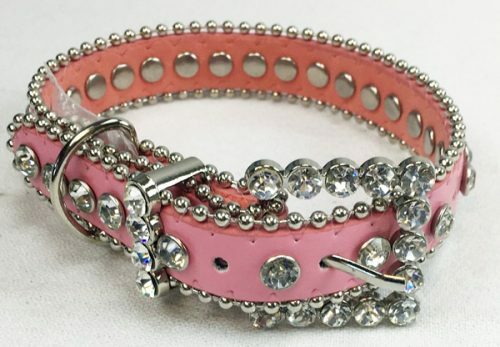 These collars may not be the super glam but they’re pretty cute! There’s even a dog collar for Pats’ Fans, and who doesn’t love the WINNERS! Or how about FLAMINGOES! They go with everything! Was this the FIRST Designer Dog Collar? 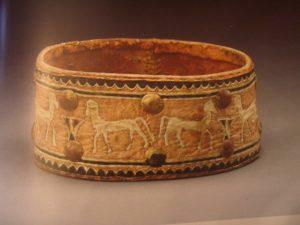 We started decorating our canine companions’ collars about 10,000 years ago. Ancient Egyptians were crazy about cats, but they loved their dogs too. This collar was found in a tomb, along with the mummified dog and owners. It’s a work of art in itself. Here’s an awesome store I came across browsing online, called MUTTROPOLIS. 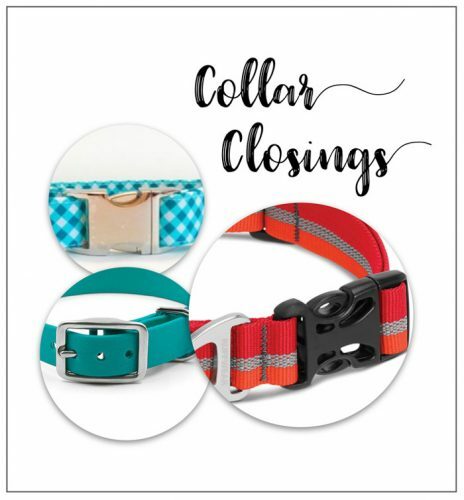 Lots of great stuff, including these unique collars. How would this look on your Morkie? To read more, visit Holly and Lil. Another gorgeous collar; this one is from Joshua Jones, again in the UK. And to top it all off, from Tiffany of course! 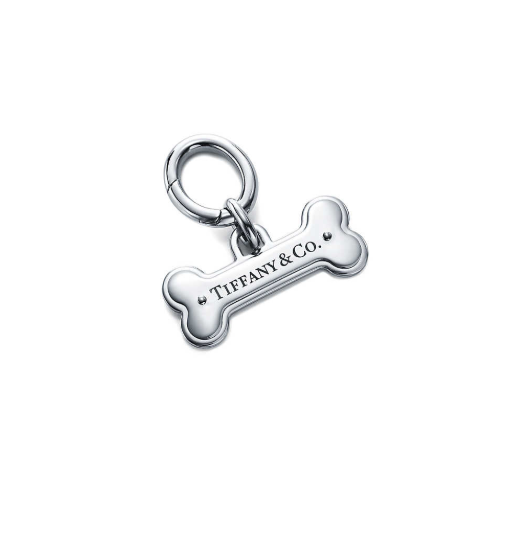 Sterling silver collar charm from Tiffany. $250. I have the feeling it is more a promotional stunt but you never know!